today we’re gonna take a look at what fashions were popular in the summer of 1829. There’s even an image of a wedding dress. Enjoy! A Round dress of Brussels lace over a slip of white gros de Tours; the body of the slip is cut low and square; the corsage of the dress is made up to the throat and fastens behind, it sets close to the shape round the upper part of the bust, but has a little fulness at the bottom of the waist. Long sleeve a l’Imbecille over the manche à la beret of the slip. A biais of white lace, finished at the upper edge by a white satin rouleau, goes round the skirt, and is surmounted by an embroidery of uncommon depth and beauty. 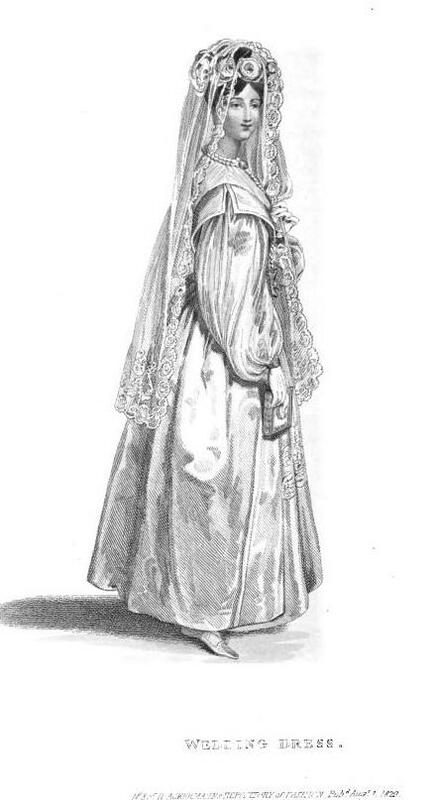 A Turkish pelisse of white satin is worn over the lace dress; it is open in front, and the corsage open before and behind falls over the bust in a deep fold, which is divided on the shoulder; a satin rouleau edges the front and corsage of the pelisse; the bottom of which has no other trimming than an ourlet of uncommon breadth. The hair is arranged in front in the Madona style, and disposed in full bows on the crown of the head. Head-dress, a garland of flowers (orange) and a Brussels lace veil; pearl necklace, from which is suspended a diamond cross; diamond earrings; gold bracelets, à la Grecque, with diamond clasps; white satin slippers laced in the sandal style; white kid gloves. A round dress composed of lemon colour gros d’eté, corsage carrée, cut very low and made to set close to the shape. Sleeve extremely short and full, confined to the arm by a narrow rouleau, and puffed out very much on the shoulder. The skirt is finished by two very deep biais folds, each surmounted by a wreath of mingled roses and wild flowers, embroidered in coloured silks. Canezou of white gaze d’Ispahan; the corsage is made to the throat, but without a collar; it is of an easy fulness. The sleeves are l’Imbecille; they are the same width as last month, but the wristbands are rather narrower. Head-dress, a crape hat of a colour just introduced, called Malvina; the brim is deeper than the hats of last month, but not so wide; the crown something higher; a rouleau of pale blue satin edges the brim, the inside of which is ornamented with coques of broad blue and rose colour gauze riband; the crown is trimmed with nœuds of riband intermingled with short plumes à Vinca, and a long white ostrich feather, which issues from one of the nœuds, and falls over the brim on the left side; the brides flow loose. Gold ear-rings of the pear form; necklace à L’Espagnole of wrought silk, fastened at the throat by a gold and ruby clasp, a ruby heart confines it at the centre of the bosom, and a massive gold cross is suspended from it in the ceinture; bracelets of wrought silk with massive gold clasps; white gros de Naples slippers; white kid gloves. A white gros de Naples dress. Corsage en chemisette, cut low and to fall much off the shoulder; it is finished round the bust with a light embroidery in white floize silk. Short sleeves en bouillon, divided by a rouleau, and terminated by a row of Vandykes. Ceinture à pointe edged with rose-colour gros de Naples, having a bouquet of flowers painted in the centre. The skirt is finished by a biais of the usual breadth, terminating in scollops, which are just seen above the rouleau that borders the biais: this is surmounted by a painted wreath of fancy flowers. The front hair is dressed very low, and in loose curls: the hind hair is twisted up in an Apollo’s knot, which is placed very far back. A band of pearls goes round the head, and is brought low on the forehead; a wreath of fancy flowers goes round the back of the head, and is arranged in the diadem style in front, and partly entwined in the knot of Apollo. Pearl necklace, in the centre of which is an Egyptian brooch, also of pearl; pearl ear-rings, similar in form to the brooch; white gros de Naples slippers en sandales; white kid gloves; carved ivory fan. A pink crape gown over a gros de Naples slip to correspond in colour. Corsage cut square and low, the back and the lower part of the front tight to the shape, but drape on the bosom. The drapery confined in the centre by a rouleau, which descends to the bottom of the waist. A falling tucker à l’enfant of blond lace, particularly full on the shoulders. Long sleeve of blond gauze, confined a little above the elbow by a white satin rouleau, and terminated by a cuff a la Marie Stuart of pink crape; the upper part cut in points, which are edged with narrow blond lace, the lower part confined to the arm by a band and gold buckle. Ceinture a la Marie Stuart. The bottom of the skirt is finished by a large rouleau of pink gros de Naples, and that is surmounted by a trimming arranged partly in dents de Scie, and partly in dents de Imp. The dents are corded with gros de Naples, and the trimming, which is disposed in a very novel style, reaches considerably above the knee. Head-dress a hat of jaune vapeur crape. The inside of the brim is trimmed on one side with an intermixture of blond lace and white gauze riband. A row of blond lace, to which is attached a rouleau of crape to correspond with the hat, is arranged round the upper part of the crown, so as to give uncommon height to the chapeau. Four white curled ostrich feathers, placed on the right side, mingle with this trimming, which is terminated on the left side by a noeud of white gauze riband brought from under the brim. Diamond necklace, white kid gloves, white gros de Naples slippers, carved cedar fan. 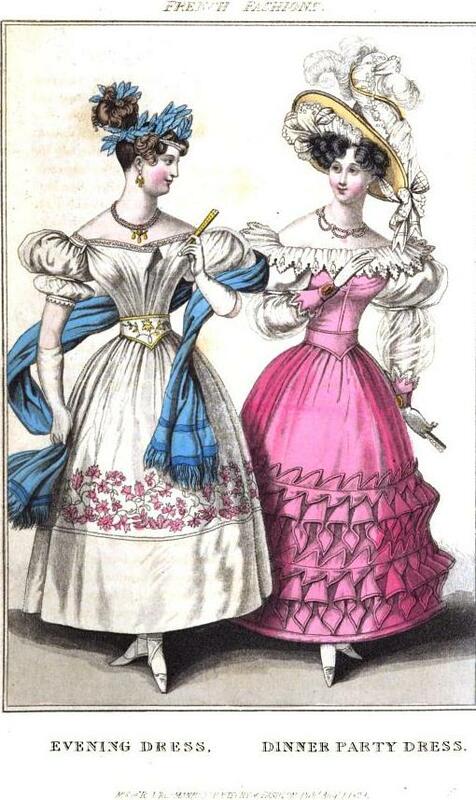 A gown of rose-colour cot-pali, corsage carrée cut very low round the bust, and to fasten behind. Short and very full sleeve. The skirt is finished by a hem that reaches to the knee, and is surmounted by two rouleaux of gros de Naples, a shade darker than the dress. Fichu of white lace, fastened behind, and embroidered in detached sprigs of foliage at regular distances round the bust. Collarette composed of four rows of white lace, arranged in dents de loup. The canezou worn with this dress is of plain India muslin; it is made very low on the shoulders, crosses in front in the fichu style, and ties behind in the centre of the waist, in short bows and ends. Sleeve à l’Imbecille of the usual fulness, finished at the wrist by a single bouillon, and a narrow cuff; and on the shoulder by a winged epaulette consisting of two falls, which, as well as the wrists and the fronts, are bordered by narrow pointed Mechlin lace of extreme fineness. Head-dress, a bonnet of rice straw; the brim is as deep but not so wide as last month: a full fluting of rose-colour gauze riband is arranged on the inside of it, next the face; the fluting is terminated by strings which are left loose. Noeuds of rose-colour gauze riband, intermingled with exotics, decorate the front of the crown. Yellow gloves; bottines of green gros des hides; green parasol of a large size. 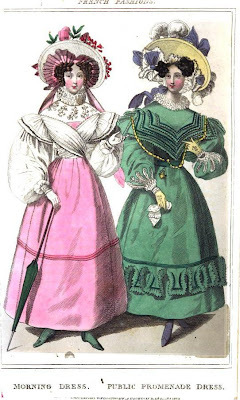 A gown of sea-green gros d’ete; the corsage made up to the throat, and ornamented en coeur with folds which turn over en schall; they are edged with narrow scolloped trimming. These folds are arranged on the back and front, so as to form a complete heart; and being open on the shoulder, they form an epaulette. Long sleeve, extremely full, but not falling over the hand, terminated by a very novel and original cuff, called a la Dauphine. We must refer our fair readers to our print for the shape of this cuff. The fulness of the skirt is more than usually thrown behind; the plaits at the sides being shallow, and not coming so forward as usual. The trimming consists of a Grecian border, formed by a rouleau of satin edged with a scolloped volant: this is surmounted by two rouleaux laid close together. Collarette, a double quilling of blond lace, put on so as partially to display the throat. Bonnet-cap of the demi-cornette shape, the border is of blond lace and very full. Chapeau demi-capote of Leghorn, ornamented under the brim on each side, with noeuds of lilac and white striped riband, intermingled with blond lace. The crown is trimmed with noeuds of gauze riband and white ostrich feathers, the latter falling in different directions. Gold ear-rings, and massive gold necklace, to which is suspended a gold enamelled flacon of the antique form; lemon-coloured kid gloves, embroidered in coloured silks: bottines of jaune vapeur gros des Indes. What do you think of these dresses? Do you like them?